Xuang lian bi is literally translated as Double Connection Bi. It is a shape orginating from the Hongshan Culture about BC.4000–3000 BC. My miniature double connection bi measuring 2.7cm is made in the Hongshan style. 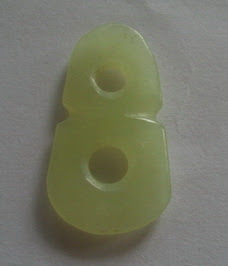 It consists of two bis which are carved from one piece of jade with the bottom bi bigger than the top bi. Genuine double connection bis from the Hongshan culture are generally larger and I am sure mine is a replica. The seller had told me quite deadpan, that "large sized Hongshan pieces can be found anywhere but a small one would be a rare find." He!He! And he expected me to swallow his tall tale! But inspite of the story which gave me a good laugh, I still bought the piece though not at Hongshan price. 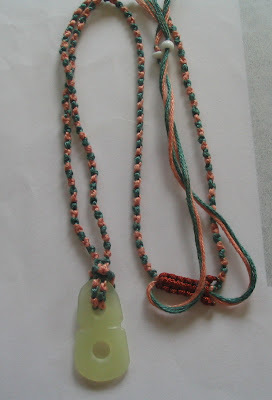 After all its quite nicely made, the jade is an attractive pale green, and this delicate piece appeals to me as my normal preference is for small over big. I am also optimistic that it may be made by a Ming miniaturist after my own heart. A final advantage is that I can wear it as a pendant strung up with my personally hand knotted cord.